Hey guys! I'm back with more fun stuff from Anonymous Lacquer. I've been trying to mix things up a bit so that you aren't seeing too many shades from the same brand in a row. I feel like that keeps things a bit more interesting. Today's post features Anonymous Lacquer Party at the Pallazo and a Cuticle Clean Up Brush. Notes: This color changes depending on who is wearing it. I've seen other swatches and it pulls more gray on some people. On me, it pulls more lilac than gray. Anonymous Lacquer sells two varieties of cuticle clean up brushes. The first variety has a rounded edge, and the second has a squared off edge (pictured above). 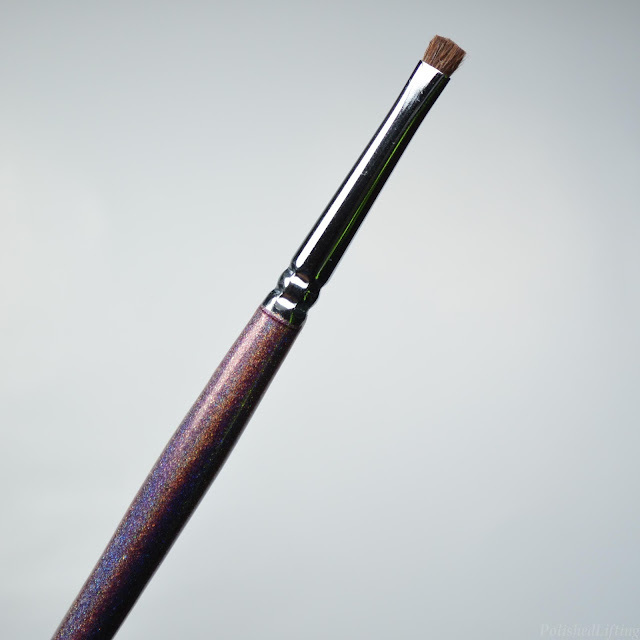 I've been using ELF concealer brushes for clean up since before this blog was started. Last year, I tried some cheapo brushes I found on Ali Express. Those were a step up from the ELF brushes, but they still frayed and deteriorated over time. Last summer at Cocktails and Colors, Mildred (Anonymous Lacquer) gave me this holo-ed out clean up brush and told me to give it a try. After several months of use I felt as though I could give it a good assessment. This handles basic clean up like a dream. It's small enough to get into tight spaces, and stiff enough to clean up dark colors. It cleans up micro glitters pretty well, but sometimes it leaves a straggler or two, As for polish decals, I still prefer some kind of thin, rounded brush for those. I think the round version of Anonymous Lacquer's clean up brush would work best. Anonymous Lacquer Party at the Pallazo is currently available for sale for $10 + s&h, and the Cuticle Clean Up Brush retails for $5ea + s&h. If you enjoyed this post you might like Anonymous Lacquer 701 Fahrenheit and Frankenstein Halloween Nail Art featuring Anonymous Lacquer. The Wrap Up & Half Up by Beachwaver Co.